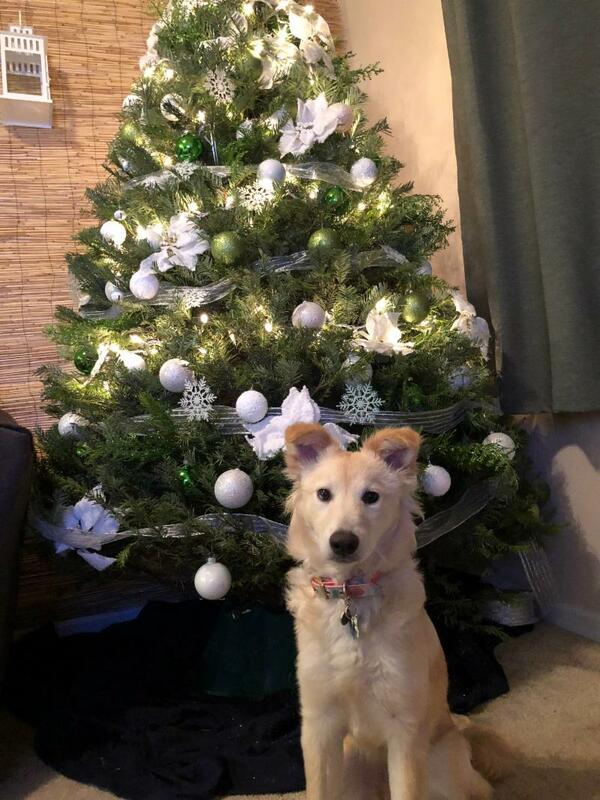 Guardians & former XANADU Dog Purchasers: Send Photos of your XANADU Dog All Decked Out for the Holidays; Holiday Photos Will Be Included in the Next Several Pup Alerts. THANK YOU ALL & HAPPY H O L I D A Y S ! 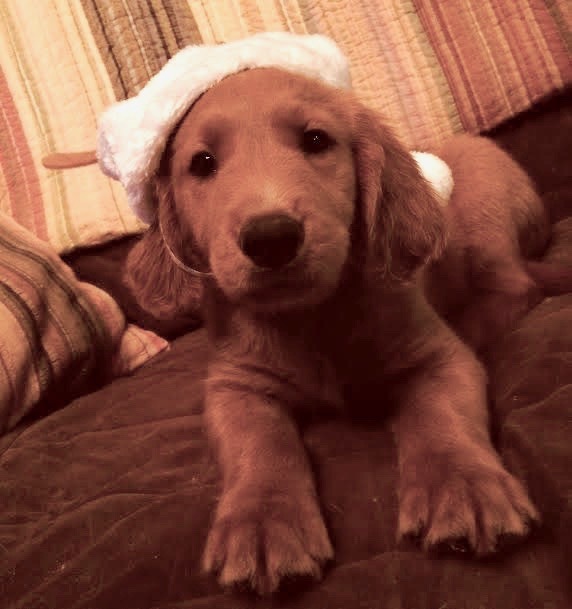 ALL XANADU Pups are GUARANTEED for Temperament, Genetic Soundness, and Vet-Checked Health. (See XANADU'S Ltd. Warranty (linked below). For additional photos of the parents of these litters, please visit xanadoodle.com "Breeding Dogs" page or see our fall Pup Alert Newsletters). XANADU Breeding Goals are linked below. This document is especially important when considering Ireland's litter. Ireland really is a gen-u-ine XANADU Dog, and not just gorgeous little Pomsky. 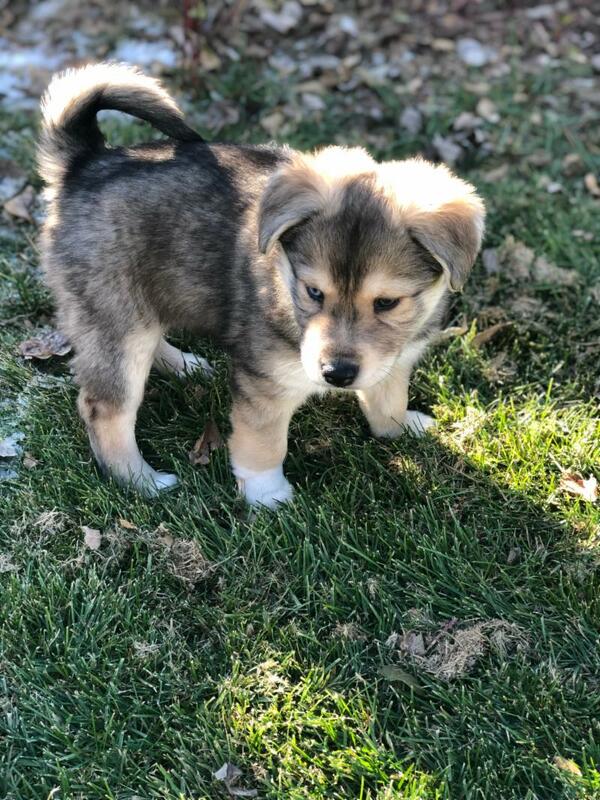 This litter's dad is an AKC beautiful, small, red- wolfy-looking super-sweet, smart Pomeranian whose name is Wolf...but Momma- Ireland has a bigger heritage than the "Pomsky" or Siberian Husky / Pomeranian hybrid). 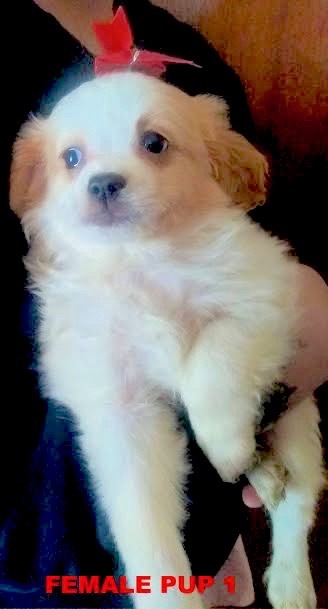 Additional breeds include (genetically-tested) Golden Retriever, Miniature Poodle, Cavalier King Charles Spaniel, Australian Shepherd...all the way back to the XANADU Foundation Dam, Habeebtea Alice. 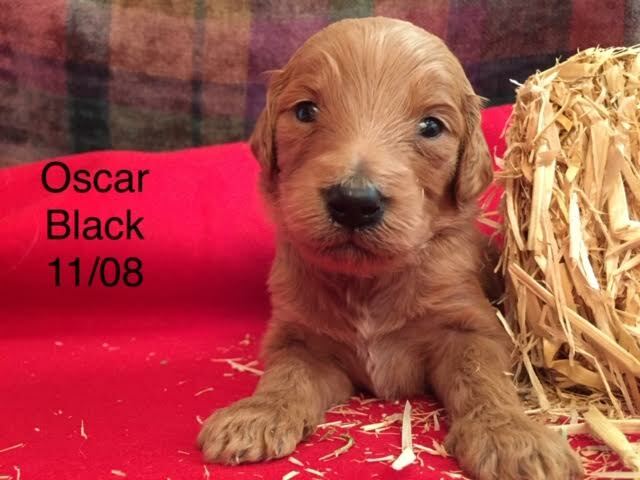 SEE below for GUARDIAN INFORMATION link IF you want our "best" pup for about 1/3 - to - 1/2 the price and enjoy having puppies underfoot. XANADU Female Breeding Agreements are for two future litters (four future litters for Male Guardians). Both a Female and a Male Guardian are AVAILABLE in IRELAND'S Pomsky litter of six. A Guardian Female is AVALABLE from EVE & ELVIS JR'S. 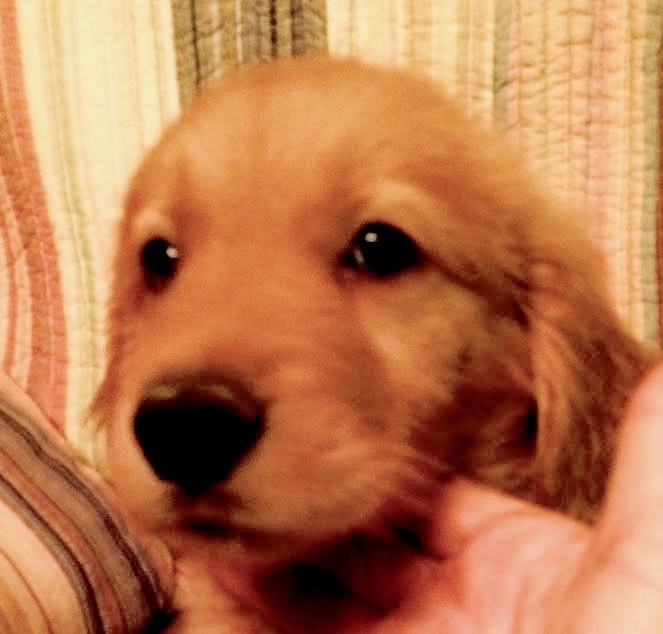 Golden Retriever Litter, and Guardians of both genders are AVAILABLE from BHAKTI'S Goberian litter. 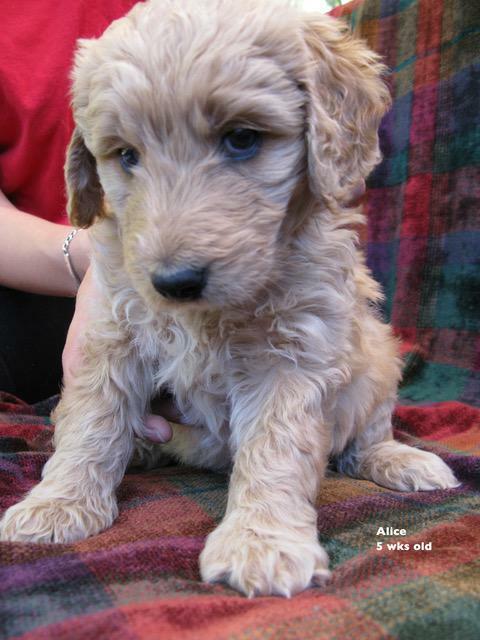 It is also possible that a Guardian pup (Baby-Alice) could be AVAILABLE from our XANADU West litter in CA -- SCARLET'S GoldenDoodle litter by Chase. Contact information for this L.A. litter is annewell@mac.com, Anne -- Anne: 323 559-4695 or Rita -- 323 496 8777. For all inquiries about AVAILABLE Guardian puppies out of Eve, Ireland, or Bhakti, please call me (Sheron) at 970 708-8030. PUP SHIPMENTS / TRANSPORTATION: You have more options now, both Stateside and Overseas. 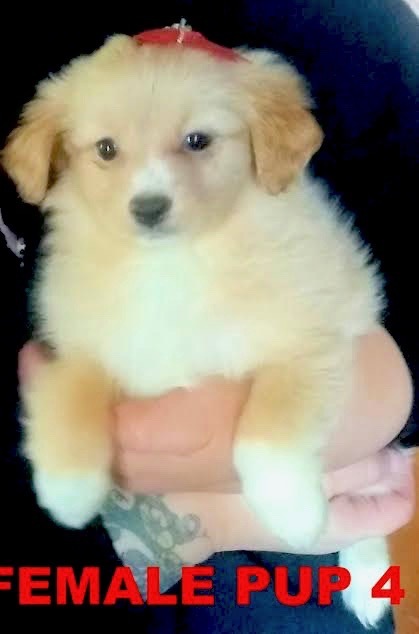 Please Note Link Below if you need assistance with transportation for your new puppy. 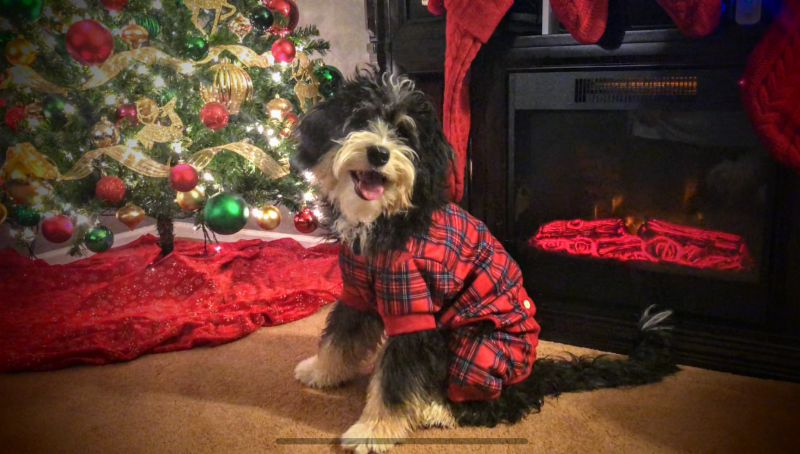 TRANSPORTATION for OUR HOLIDAY LITTERS -- Airlines get cranky about shipping pets close to Christmas; they just won't do it, and we don't want a XANADU baby to be bumped in pet cargo in favor of a suitcase. 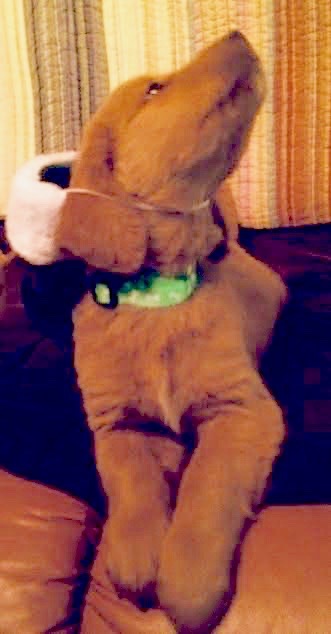 Santa's gifts to good children will be available to fly when they are eight weeks old, and a pup cannot be held longer by Guardian families or at the XANADU Headquarters. Our babies will be available for flights and available to be picked up from Guardians on the front range of Colorado (Pueblo to Denver and through Longmont) through early December. Puppy photo attachments and XANADU Breeding Goals (See Links) will let you know if you want XANADU'S Breeding Goals in your new BFF. XANADU'S Mission is the development of the World's Best Family Dog. ALL of these litters' pups will be intelligent, attentive, highly-trainable adult dogs. 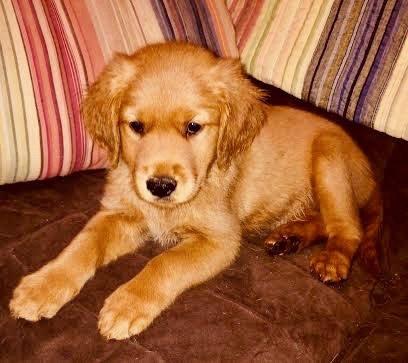 Personalities and characteristics differ in our current litters, and many puppies in XANADU litters (especially Eve and Ireland's litters) are expected to be GREAT SERVICE DOG CANDIDATES. Please inquire if you hope to train your pup for service. Do remember that all pups are sweet little terrorists...they ALL need positive training. I recommend pro-active training books and puppy classes. Your veterinarian or local Pet Shop can help you find a good trainer in your area. There are six pretty pups in this litter -- four females and two males. 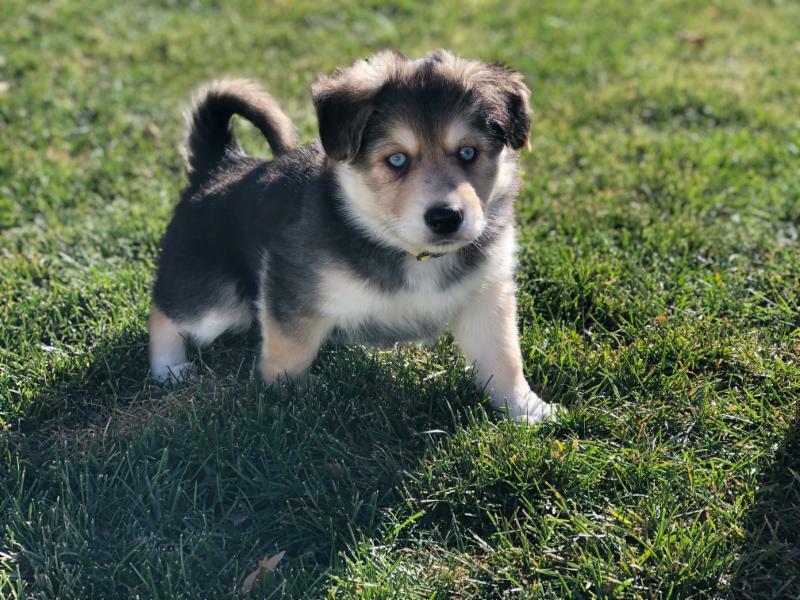 This unique litter will be smaller than most Pomsky litters. As noted in our previous Pup Alert Newsletters, it's important to read our XANADU Breeding Goals document (See Link) . 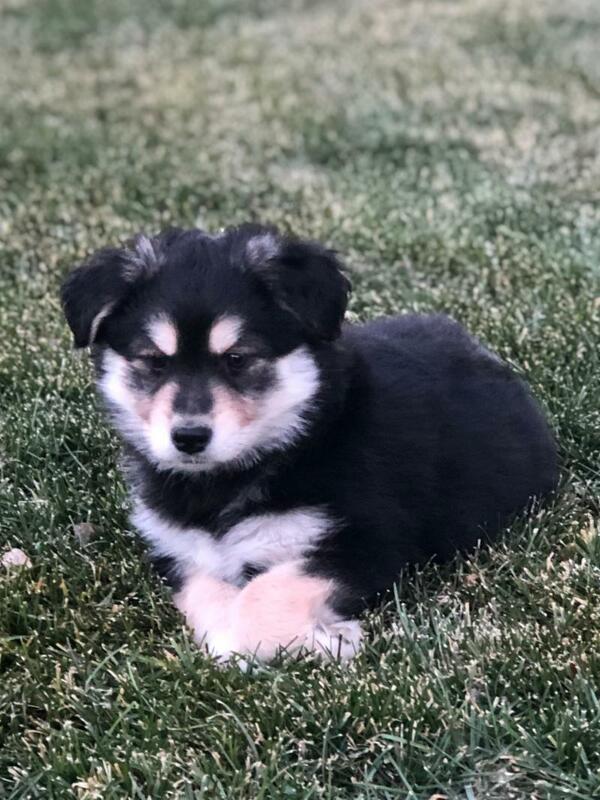 Our little Pomsky pups are different, smaller, have better temperaments than most Pomskies, as part of our breeding program toward the XANADU Mission: World's Best Family Dog. Puppies from Ireland & Wolf's XANADU Pomsky litter are hearty, healthy, fat and happy, eating both science diet kibble and canned food. They have had their new - puppy veterinarian check-up. They all have 10+ personalities. Note from breeder, Sheron: Some Pomskies have ears that stand up, and some don't. Pomskies that are bred back to Pomeranians (F1-a or b litters) often have pointy or rounded stand-up ears. We don't expect stand-up ears in this litter. (We do expect stand-up ears in Bhakti's Goberian litter by Cedar). 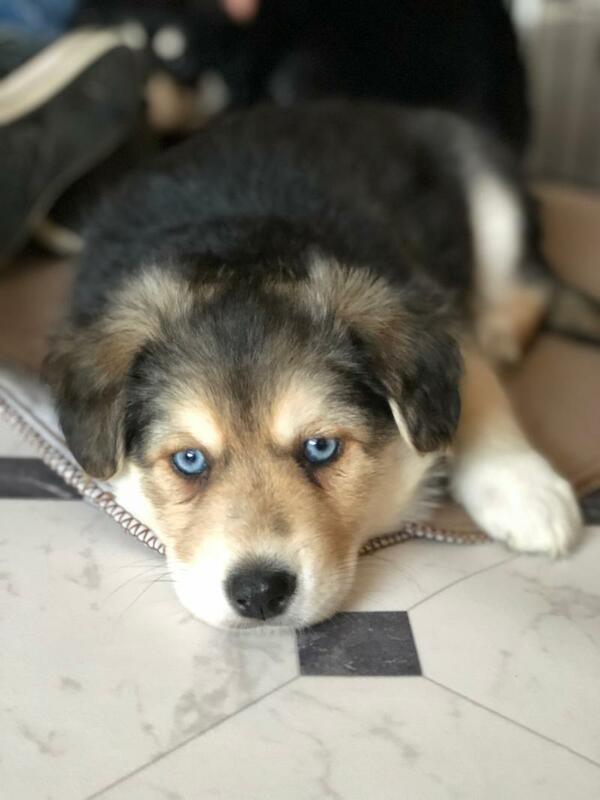 Several pups in Ireland's have partial-blue eyes, but only one female has enough blue (that'd be Momma's Clone, Female #3) to be considered as having a blue eye. The other partially-blue- eyed pups are to be sold for the same price as brown-eyed pups. All puppies do have daddy's soft fluffy Pomeranian coat. $400 Deposits are Currently Being Accepted; Please Contact Mandi at xanadupack@gmail.com. XANADU pricing is several thousand dollars less than Pomskies advertised on the east or west coast. The Pomsky is a small, beautiful, and hardy hybrid. 1. I call this GUARDIAN FEMALE sweetheart, "Make-up," for the beautiful unique markings all the way around her eyes. 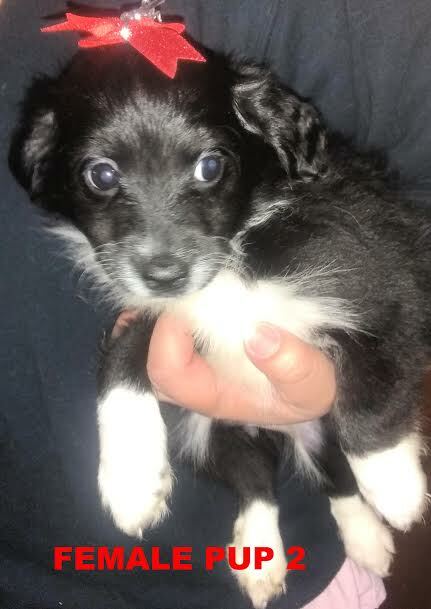 She is the quietest puppy of the bunch, very docile, just loves human cuddles. Make-up is not very vocal (well-mannered puppy) likes to take naps on you. Her coat is more silky than fluffy, and she likes bathing and brushing. to be around. Outside, she loves jump into piles of leaves & walk my little male dog around on his leash. She's a go-go dog. 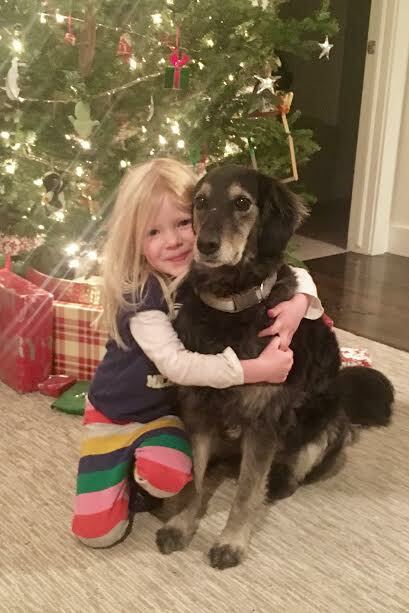 During trying times, she is a natural nurturer and BFF and always knows when to give you a hug and a kiss. She loves taking baths and will hop around in the water like popcorn while in the tub. She's fluffy, like her daddy, Wolf, likes to be groomed, and have her teeth brushed. 4. Female Pup 4 is This female is a character, does anything for food or attention (that is, she will be easy to train). Loves, loves, loves to play with people. Likes her baths and loves to run and slide in the water. She thinks she can play cannon ball in a pile of leaves. Drags a 7' towel everywhere, and makes her own bed when tired and wants to sneak away from other pups. 200% personality. 5. GUARDIAN MALE Pup #1, This puppy is the king of the puppies here; he is GORGEOUS, and he knows it. He likes to strut around rather than walk. 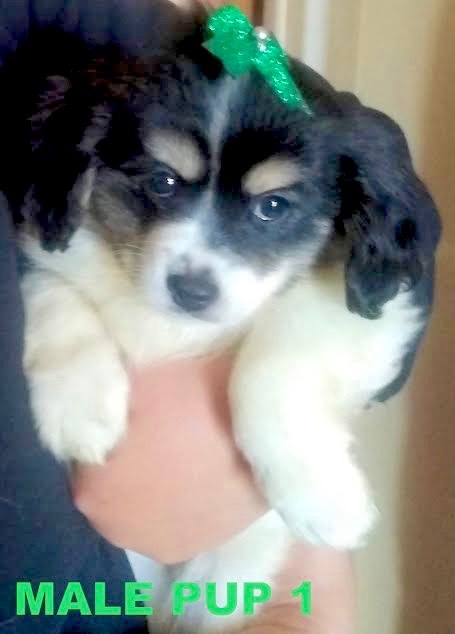 Our Guardian Puppy -- beautiful tri-colored male black, white with buff/tan/red highlights, perfect markings. Very personable, happy to see anyone, loves being a buddy. Likes baths and cuddles. Our Guardian is super fluffy but ultra-silky-shiny fluffy. Likes to be brushed, and if you stop brushing, he will put a paw on you for you to start again or grab the brush and bring it back to you. Guardian Gorgeous is fairly quiet, laid back, and easy to care for. He plays with all little toys, and loves playing with humans the most. When you talk to him, his whole body quivers with excitement. Guardian Male PUP Price: $1450 Guardian Male will have a Breeding Agreement to sire four litters as adult. 6. 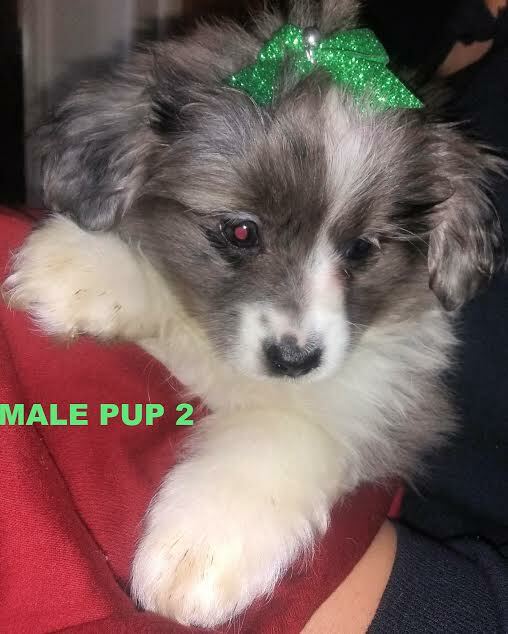 Male Pup 2 --Another Beautiful Boy: This boy has blue merle coloring-- gray, white, with black. He is super playful; likes to carry his own leash; loves being bathed and brushed. This is a little fluff ball, like his daddy, Wolf. He has three times as much hair as body underneath, and is laid back and quiet. He wants to be with you and be a constant companion and keep you company. 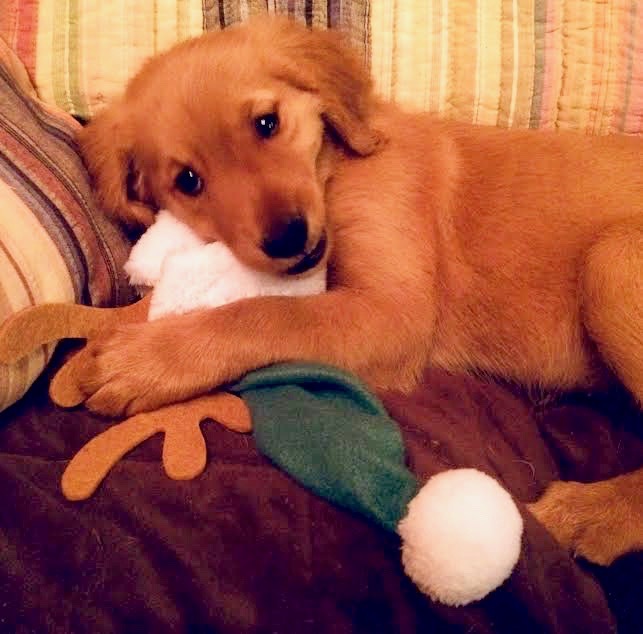 He likes stuffy toys, but quietly plays with them. He takes his bed everywhere in the house, and likes to hide his toys, leashes and other treasures in his own secret stashes. Loves your lap and hugs and kisses. 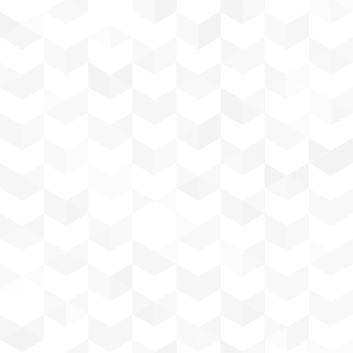 Beautifully marked grey and white with black accent spots in the grey. He is Very Fluffy and likes to have his nails done. 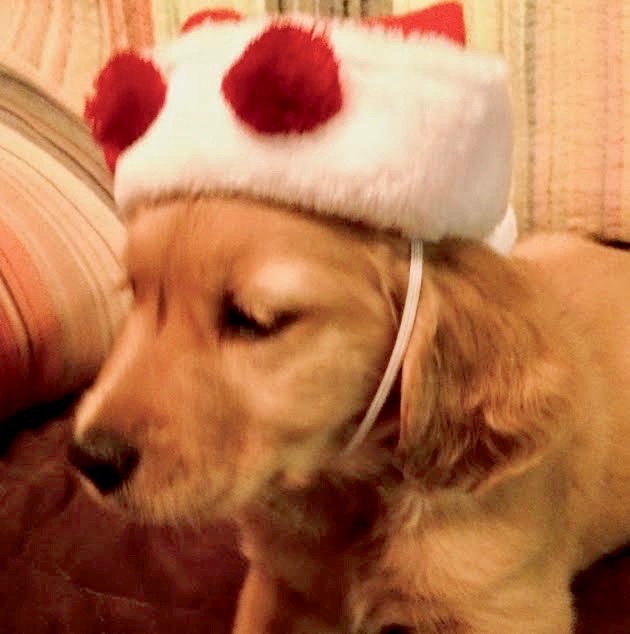 (Note from Sheron: Did we say "pre-spoiled" for his new owner? 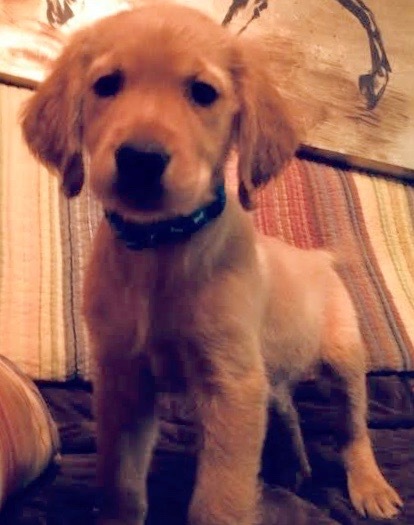 Z OE'S GOLDEN RETRIEVER LITTER BY AKC ELVIS, JR. (Also, please refer to previous Pup Alerts for photos of this remarkable litter.) Finding a Golden Retriever who tests clear in all 165 of Cornell University's Embark Genetic Tests is almost impossible. Puppies from this litter are not to be registered. XANADU will be the sole owner of this lineage. 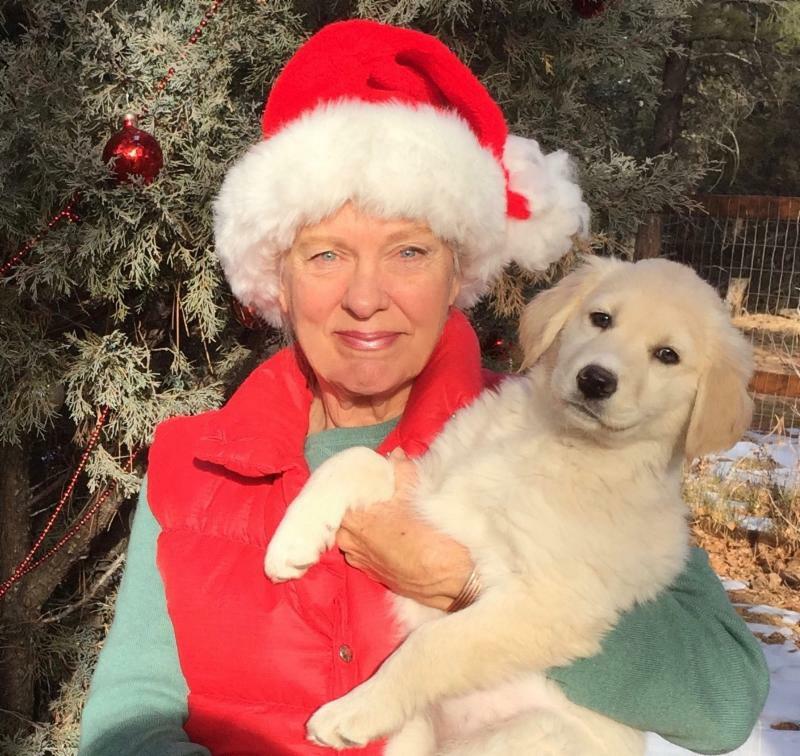 You could pay $10,000 or more for a registered Golden Retriever pup that does not have this litter's genetic credentials, hardiness, and guarantee. 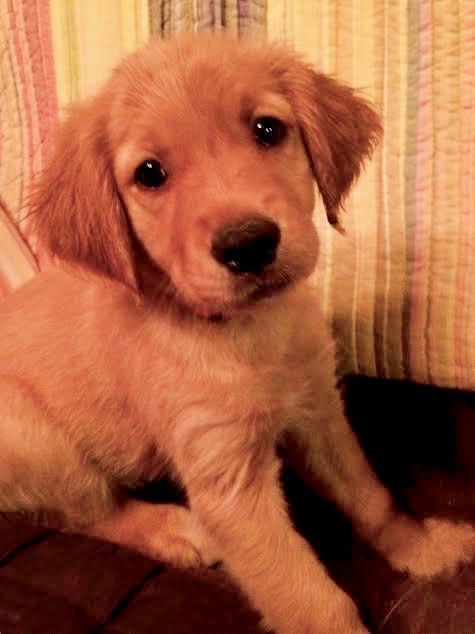 We are very proud, and this is probably a once-in-a-lifetime chance to get a GREAT American Golden Retriever puppy. XANADU will not repeat this breeding. IN THE FOLLOWING GROUP OF AVAILABLE PUPS, WE HAVE ONE FEMALE GUARDIAN PUP, ONE LITTER PICK FEMALE PUP, AND PET HOME PUPPIES. 1. AVAILABLE FEMALE, "SPARKLE" w/ Red-Paw Collar (previous Pink-Sparkle Collar. Very laid back little girl-- like sister, Ruby (below). Sparkle interacts happily and loves to play, yet is super- chilled-out. Sparkle would rather watch or snuggle than jump into the fray! 2. AVAILABLE FEMALE, "RUBY," Ruby’s a bit lighter in color than Sparkle, but stil l red. She is also laid back, like Sparkle. These two seem to enjoy chilling out together and watching the antics of the others, but they will interact well and play happily, too. Like sister, Sparkle, Ruby enjoys interaction with humans! 3. AVAILABLE FEMALE, Multi-Color Collar . This little gal loves to climb! 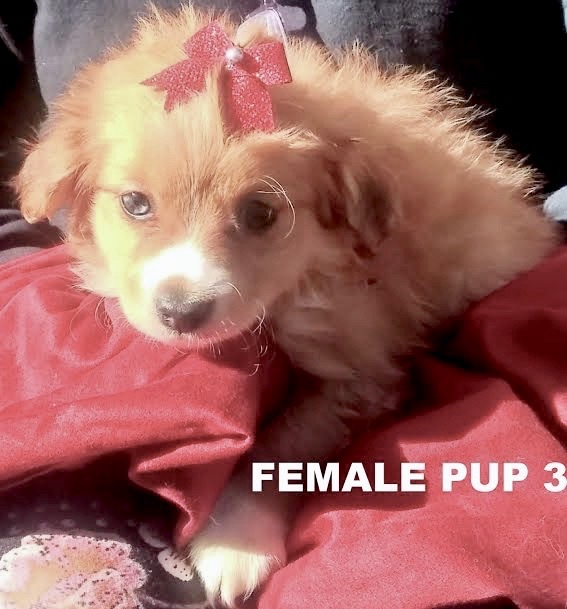 Very curious and active - - smart puppy, who could be a wonderful companion to an active person /family. "Multi" (as in "multi-tasking!") has a small white mark on her nose, and is a beautiful dark red. 4. 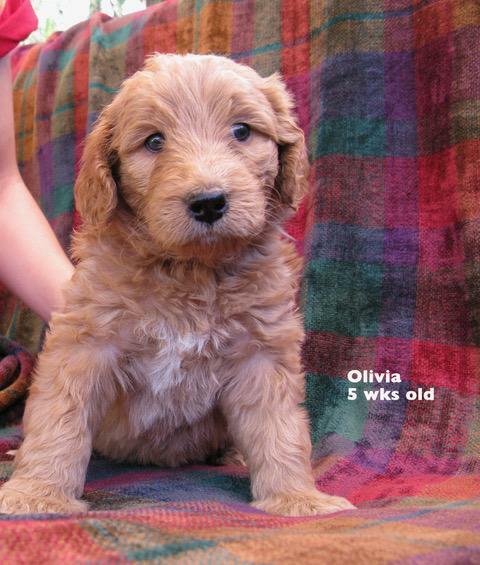 AVAILABLE FEMALE, Blue-Collar (Photo of standing pup who is facing the camera). Lightest color in the litter; small white patch behind right shoulder. Blue- Collar is smaller in size (like the Guardian male). She is a very happy, interactive, and playful girl! Energetic, but not at all fussy. 5. 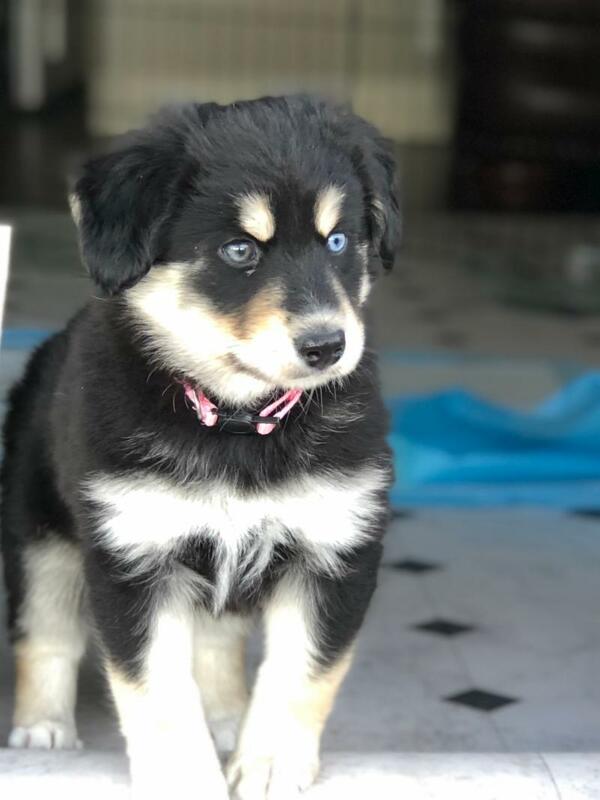 AVAILABLE FEMALE, Teal-Collar (formerly Green Collar Female) Boundless energy female that is fearless! Loves to play with her toys, brothers and sisters, and she also interacts beautifully with her human. Very curious and confident--and pretty, too! 6. AVAILABLE FEMALE, Blue-Stripes (formerly Orange-Collar Female) . Pretty golden-colored female. This girl is destined for greatness: She was the first to respond to my voice, first to search out the source and move towards it. She has light eyebrows which are distinctive. She’s curious, but easy going. Loves to interact but not demanding. Probably a great Service Dog candidate, or just a knock-your-socks-off very smart best friend to you and your family. 7. AVAILABLE MALE, Multi-Color Collar. 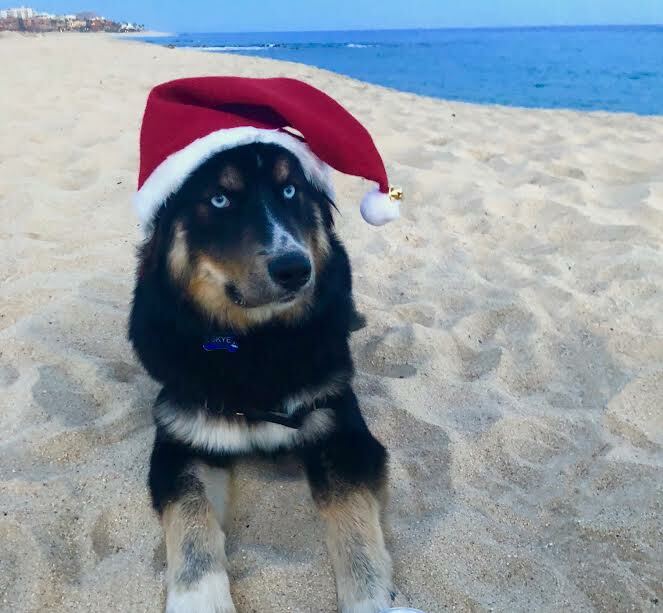 Beautiful red fella wearing Santa hat in photo. Rather a laid-back youngster, but loves to play and interact. Has huge paws and tiny white spot near nose and on his back paws. 9. AVAILABLE MALE, Black-Collar Boy. Medium-Red coat. Fun - loving, active pup who loves games with his sibling BFFs. Social, playful, and happy! 8. AVAILABLE MALE, Green-Collar, Beautiful red boy. Very curious and playful! 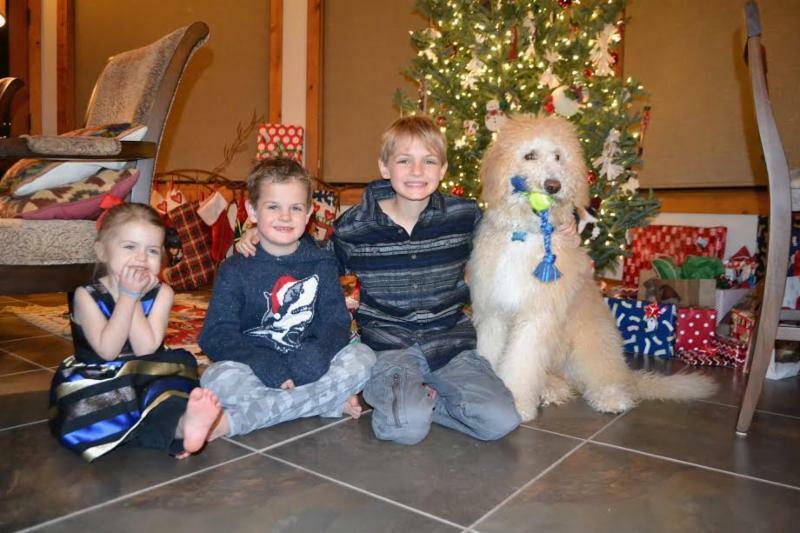 Enjoys the interaction with other dogs, especially his siblings and his human friends. 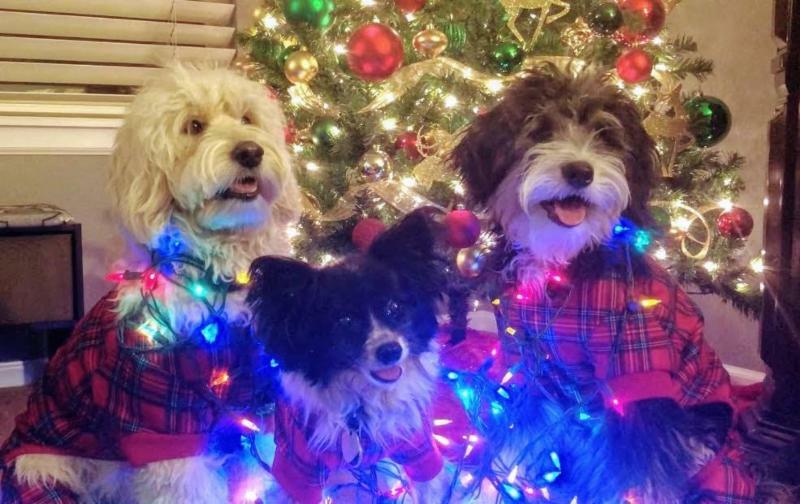 This litter belongs to Anne & Rita in Los Angeles. BOTH parent dogs are XANADU'S best: Sweet, Smart, Genetics and General Vet-Checked Health over the top. And so, I am advertising this litter for my CA BFFs. 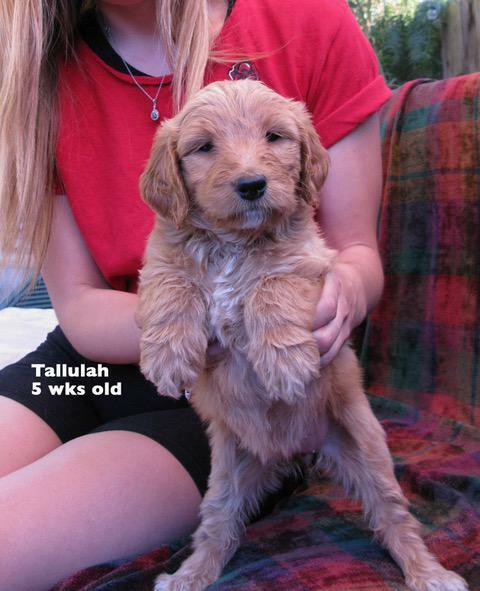 Photos of parent dogs are on www.xanadoodle.com. Darling puppy photos follow. 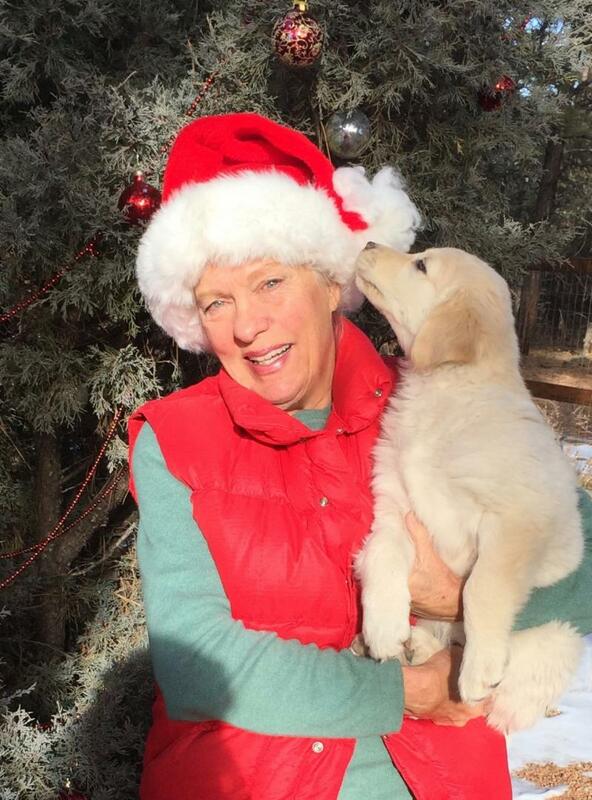 Please note that Rita and Anne named one favorite pup after XANADU Founder, Alice. And Alice may be a Guardian. 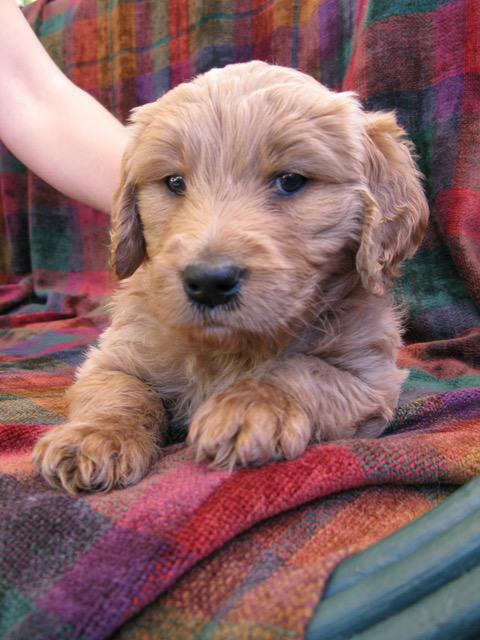 All pups have dark brown eyes and are expected to be 40-45# full grown (unless otherwise noted). Coat: Red-brown. 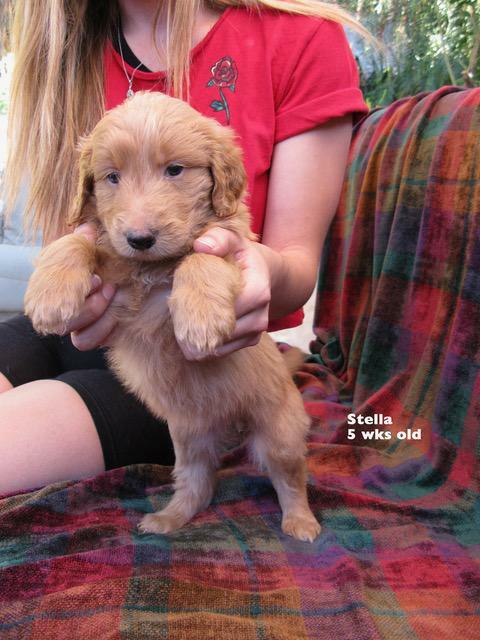 Very soft coat, wavy but one of the smoother pups — more retriever-ish. Personality: A smaller girl with a strong spirit. Stella would be great for an active family — very alert, very smart. Coat: Blond and curly — a standout beauty. Dark eyeshadow. Personality: We gave this girl a powerful name, and we believe she will live up to it. Little Alice has all the traits that Xanadu seeks, and we would like to see the line perpetuated. Size: So far she is a smaller pup. Coat: So handsome! White blaze on his forehead, white chest and spats. 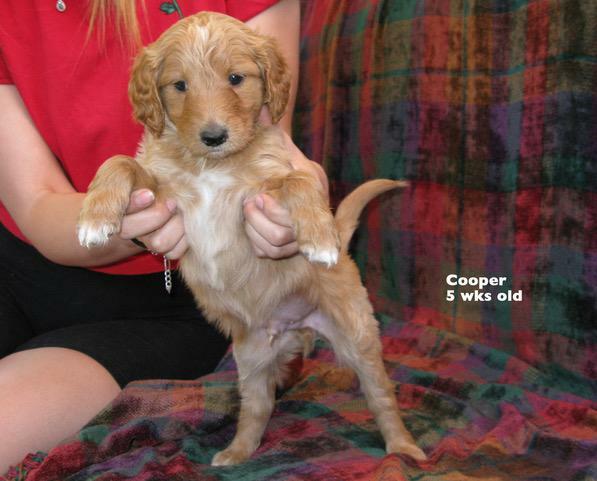 Cooper looks much more like his dad, Chase, than do the rest of the puppies. Remarkable resemblance. Personality: This boy has a lovely shyness that captures everybody’s heart. 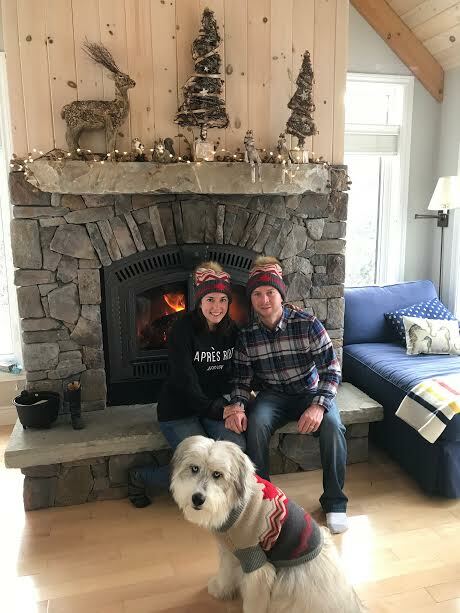 We love Cooper! Size: One of our smallest pups. Coat: Wonderful fluffy light-brown coat with lots of white touches here and there. Personality: Tallulah somehow photographs as a comedian. 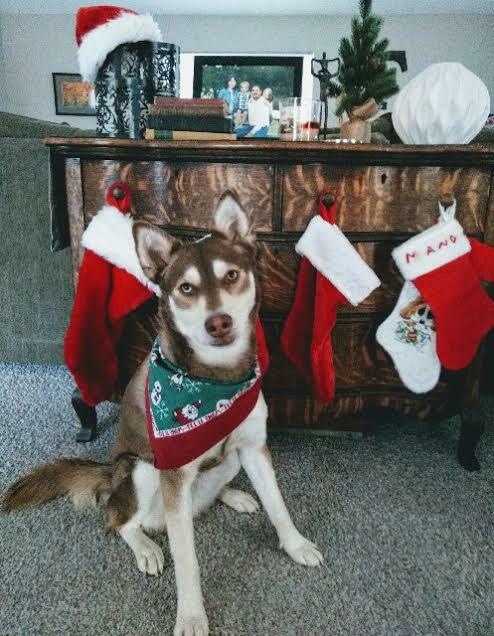 Every time we take her picture, she makes us laugh. We think she’ll lift her family’s spirits for years to come. Coat: Light brown. Wavy, white highlight on chest and some variation on face and haunches. Personality: One of our smaller boys. 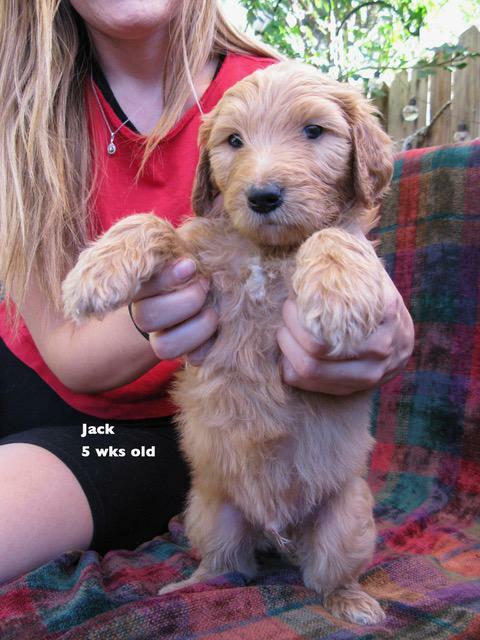 Jack is fun, likes to wrestle, likes people, loves to cuddle. Perfect BFF for a little boy. Coat: Light brown; can seem ash blonde in certain light. Wavy, white highlight on chest. Shadows around eyes and nose. Personality: This guy has something special. He is friendly and sociable, yet he is a BIG, profound presence. 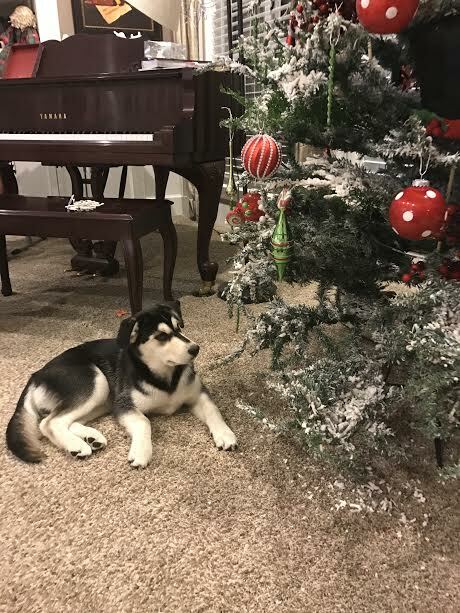 We think he’ll be a big dog. Size: We’re thinking 60+ lbs, bigger than the parents. Personality: Smart — they all are! — loves to play with her littermates. Very social. Coat: Blonde, curly, gorgeous in an all-American way. A standout. 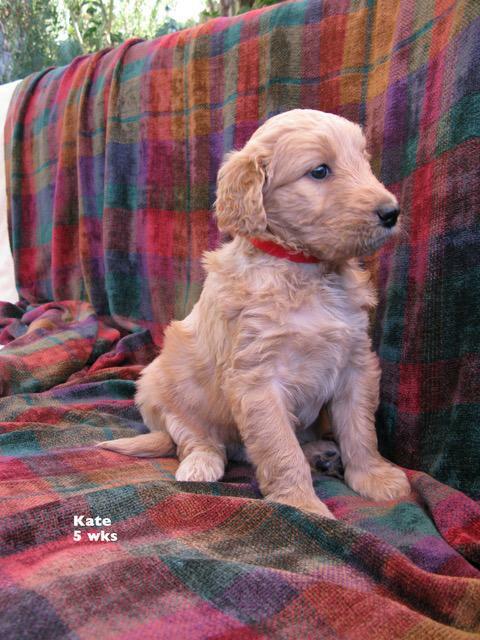 Personality: Kate is curious, sociable, and loves to wrestle with her littermates. Size: One of our bigger pups. We expect her to grow to 45 to 50 lbs. Coat: Red. Gorgeous! Fluffy and soft; a perfect doodle. 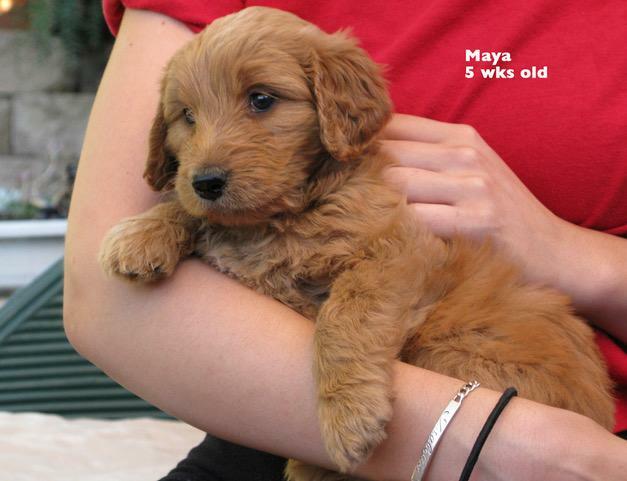 Personality: We noticed right away that Maya is curious about the world outside. We think she’d love going wherever her family goes. BHAKTI’S GOBERIAN LITTER, SIRED BY CEDAR (and another true XANADU cross). These puppies will probably be the most beautiful dogs you have ever seen. ALL are tri-colors with beautiful markings. Some have one or two blue eyes. Pups should grow to a size of about 45 lb. as adults. Coats should be plush. Both genders are AVAILABLE. Hazel-eyed pups are usually the same price as the brown-eyed puppies. Green eyes often turn hazel. Remember that brown eyes are dominant, and a brown-eyed puppy is just as sweet and smart and healthy as a pup with bright blue eyes. Vanity options do cost more. Please contact me (Sheron) for Guardian male and female information and purchase: 970 708-8030). Please remember that I don't text well; just call any time. PINK Miss Pink is a pretty, pretty princess. She is a bit timid - it took her awhile to get used to going outside - she would stand just inside the sliding glass door (as pictured) and whine at her brothers and sisters to come back to her. She doesn't seem to like the cold or the snow, but if there is someone looking for a snuggler, this one is for you! She loves snuggling in blankets. She is sweet, but may need someone that has plenty of time to devote to just her - perhaps someone without other dogs? She is a beauty though - she has one blue eye and one green eye (expected to turn hazel). She is a mini-Bhakti. YELLOW Miss Yellow is MY favorite. She has light coloring on her face that really accentuate those bright blue Cleopatra eyes. She is absolutely gorgeous, but is also equally sweet. While all of her brothers and sisters are playing, she will sit quietly looking at me for me to pick her up. She likes to hug and snuggle. She is the calmest of the group, but like any puppy, can also be playful at times. She loves her belly being rubbed. This one just melts my heart! BLUE Little boy blue is my husband's favorite; he's a man's man -- rambunctious, playful, active, somewhat of a power chewer (I always have a toy ready for him! 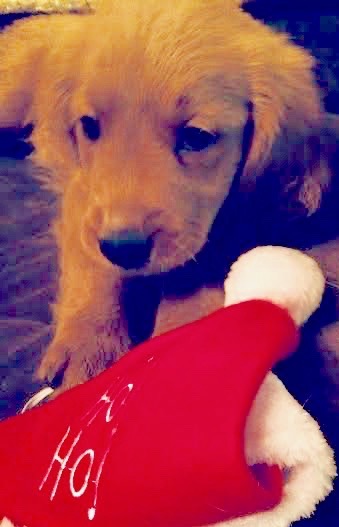 ), but he does have a tender side too - he likes to hug, and he has the softest coat of the bunch. This is the guardian male. 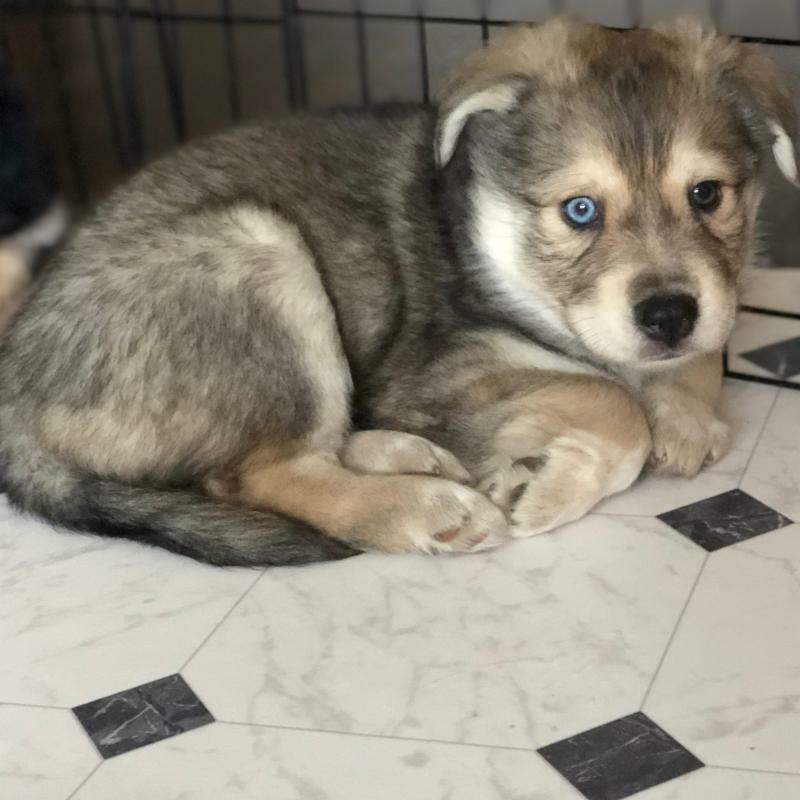 He has more of the husky look, and has one brown eye and one blue eye. He is not very timid - he was the first to jump right off of the stamped concrete slab without hesitation while his brother and sisters were more cautious.